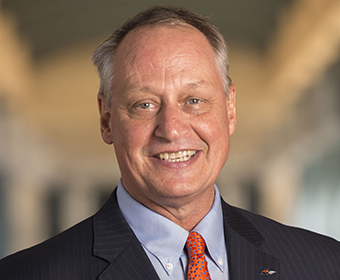 As a board member of the Coalition of Urban Serving Universities, UTSA President Taylor Eighmy will work on initiatives to enhance student success and to achieve community transformation. (July 2, 2018) -- The Coalition of Urban Serving Universities (USU), an organization committed to increasing prosperity and opportunity through city-university engagement, has elected UTSA President Taylor Eighmy to its board of directors. Aligning with Dr. Eighmy’s vision for UTSA as an exemplary urban serving university of the future, the university became a member of the coalition in November 2017. The coalition consists of 37 U.S. public research universities located in major metropolitan areas, all of which have committed to actively contribute to the success of their local economies. President Eighmy first became involved in USU during his time at Texas Tech University where he served as senior vice president for research. In partnership with the Association of Public Land-grant Universities (APLU), USU leads the Office of Urban Initiatives. USU’s work centers on two reinforcing pillars: initiatives working to advance student success through innovation and initiatives aiming to achieve community transformation through partnerships, including joint efforts with the Association of Public and Land-grant Universities (APLU). Eighmy’s term on USU’s Board of Directors goes through June 2021.